As I sit in Reagan National Airport in Washington, D.C., my recent experiences in Washington, D.C. at the National Communication Association Convention (NCA) and as a citizen in America’s capital city overwhelm me with reflections about my professional career; my students and professional colleagues; and the opportunities I have been given as a citizen to participate and serve. I have been attending the NCA conventions since 1981; it is the gateway to the academic community that has nurtured my career. This year, over 5,000 participants were in Washington, D.C.–from Wednesday through Sunday–presenting short courses, programs, panels, and conducting the business of the various interest groups and divisions making up the association. The two papers I presented as lead author were designated as being among the best in their respective interest areas. These papers focusing on risk and crisis communication and experiential learning through service were the collaborative efforts of graduate students and professional colleagues across the country and I was so pleased our work could be recognized on the “top papers” panels. Another exciting happening included the national launch of the book I co-authored with Michael Bartanen from Pacific Lutheran University (Tacoma, WA) entitled, Forensics in America: A History, and a special reception hosted by Pi Kappa Delta and my NDSU departmental colleagues to celebrate the occasion. One of the benefits of a national convention is the opportunity to learn and grow. For me, this opportunity came when I served as chair of a special panel exploring how crises are memorialized. Our particular focus was on the Pentagon attack on 9/11 and the resulting Pentagon Memorial, dedicated on September 11, 2008. Our panel began with James Laychak, Chairman of the Pentagon Memorial Board of Directors, who provided how the Memorial was conceived and created as a memorial to honor the 184 people who died either on board the aircraft or within the Pentagon building on 9/11. Two of my former students were among the young scholars presenting papers on the meaning of crisis memorials, symbolically and as a source of understanding and healing for those affected. After the panel, we left the convention site and toured the memorial. The experience was very moving as the youngest victim was just 3 years old, traveling with her parents and sister to Australia. The oldest was 71. There are too many symbolic elements to describe here. However, most meaningful to me was walking along the edge of the memorial and stopping on my birth year to see the number of victims who should have been enjoying life at my age. How can one express the sorrow of that loss; and the thankfulness of being where I am in my life today? After the Pentagon Memorial, my cousin and I toured the World War II Memorial. The memorial is divided between the Atlantic and the Pacific theaters and each state and territory is identified with a wreath to remember those who served in the armed forces. I stopped by the South Dakota memorial and then the North Dakota memorial; thinking about what it meant for young men and women from the Dakotas to leave their families and homes behind in order to be part of something more important–a fight for freedom and our way of life. My pride in being an American citizen overwhelmed me. I thought about what it would mean to represent all of the the United States on the International Board of Lions Clubs International. I was filled with humility and hopefulness. This year, Thanksgiving takes on a special meaning for Kathy and me because we have been given the opportunity to take stock of what is important in our lives and how we believe we can contribute to making our world a better place. We are thankful for those who have been our mentors and have given us guidance on our pathway of service. We celebrate the gifts that our friends and colleagues have shared with us to help complete tasks and move forward in the future with confidence. We thank you for the inspiration that you have given us; and in all sincerity, thank you for the kindness you have shown to us. These personal gifts you have shared with us mean more than you can know; and provide us with yet another reason for why serving with you is an honor and a pleasure. I will end this entry with a happy thought! While at the convention, I was able to share a meal with two dear friends. 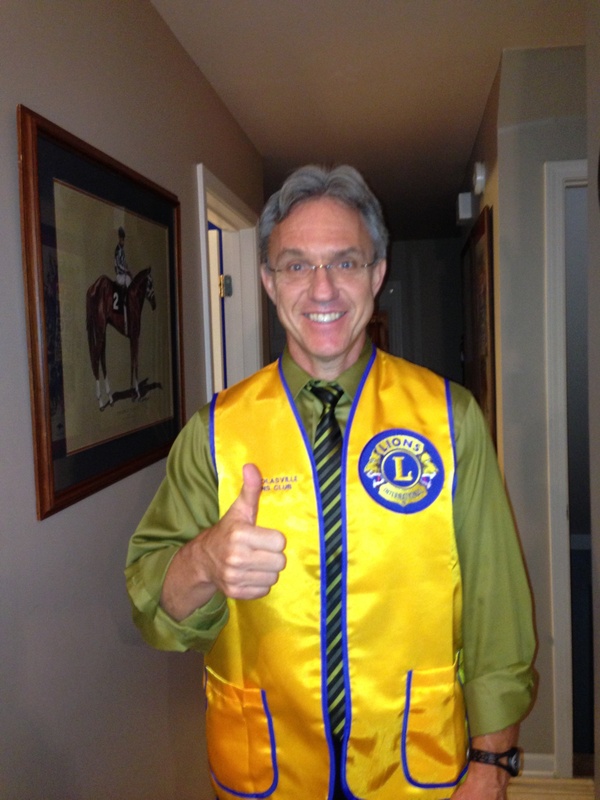 While we were colleagues at NDSU, I encouraged and eventually sponsored them to become Lions of the Fargo Lions Club. They were active young members while in Fargo, but when they accepted professorial positions at the University of Kentucky, it took a while for them to find a Lions Club where they felt at home. 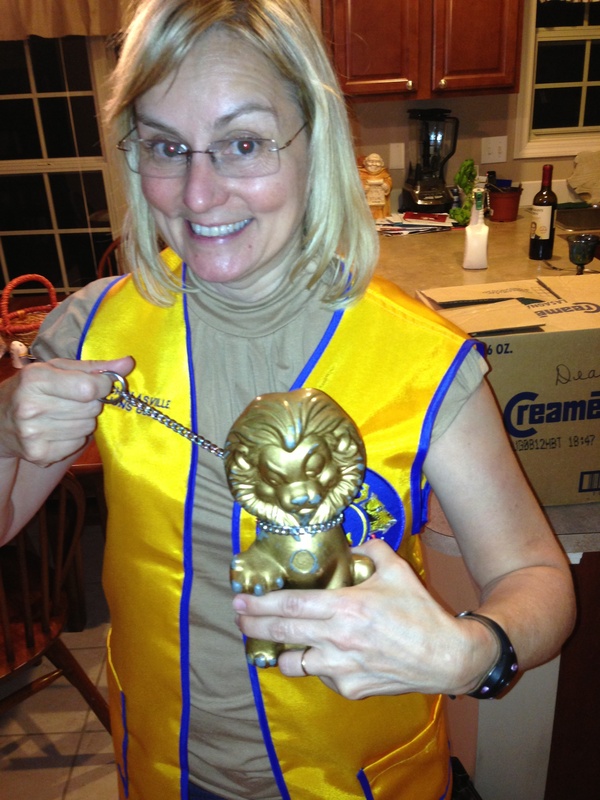 They were proud to share with me that they are now very active in their Lexington Lions Club–in fact, Lion Deanna is the popular Tailtwister! She has introduced singing and happy thoughts to the club and everyone is energized by her enthusiasm! Lion Tim is always supportive and ready to go, enjoying his service activities. They may have joined the Fargo Lions because of me, but they renewed their membership in their new Kentucky home because they are Lions in their hearts and service to others gives them joy! That’s another reason for me to give thanks!